The team was excellent to work with! Thank you! This was a picture postcard perfect weekend, The cabin was a perfect setting for a magical Christmas, and he proposed! I said yes! Joseph and Wallowa Lake has been a solace for me for over 20 years. Thank you for continuing to provide a healing, quiet place that is free from corporate businesses. My wife and I were looking for a relaxing winter get-away, and the cabin we rented blew us away. It was homey and beautiful with a fantastic forest and mountain landscape around it. Perfect for staying inside with puzzles and reading, and a perfect location to start a snowshoe adventure. We will definitely be back. WLVR is our go-to for stay-cations. Just because we are locals doesn't mean that we don't enjoy a get away to the lake! And as always, Cindi and her crew had the home spotless upon our arrival. She NEVER fails to amaze me with her cleanliness and making sure each home has everything you would ever need. This stay, we rented #55 for our daughter's surprise 16th birthday. The cabin was perfect for her and her girlfriends. They played games, made a few trips to the hot tub, and giggled them selves to sleep all in one room. Meanwhile, I cozied up in the king size bed in the master and enjoyed having a tv and bathroom to myself. The kitchen was fully equipped for me to feed them dinner, snacks and a hearty breakfast. I enjoyed all the photos of the lake throughout the home. The only issue I had is getting the lock box to close. That was difficult. Otherwise......excellent stay. This amazing cabin was comfy and cozy, and provided ample space for all 10 of us! Loved it!! Even though this home is larger than what I would call a cabin, it has the true cabin on the lake vibe. The spacious deck overlooking the lake, the trail to the water, and the dock were the perfect spot to reconnect with a group of girlfriends. At sundown, we went inside and spent hours at the large table playing games, snacking, sipping and toasting friendship. Lots of room for sleeping and showering, too! Our annual girls weekend was spent at #47 this last year. What a perfect choice! The open concept kitchen and living space allowed us to snack and refill glasses without missing out on anything. Many hours were spent lounging by the fire and appreciating the beautiful view of the lake and the interesting stone work on the hearth. There was plenty of space for us to spread out for sleeping when we finally turned off the conversation. This home was warm and inviting and the perfect setting for a retreat weekend. Thank you so very much for sharing your beautiful and comfortable home. We had a splendid time and hope we left it in good order. It's so easy to cook and clean up, shower, jacuzzi etc. We 5 (4 Finnish cousins from Finland and 2 from Oregon) say THANK YOU AGAIN AND AGAIN! Our stay was great! Amazing cabin and home. We enjoyed Joseph very much and it was great to come back after 10 years! My dad used to work at the rodeo! We had a great time! The Dei's Lodge cabin is beautiful and a great location near the lake. Loved the architecture. 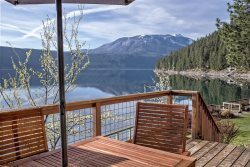 We've stayed at least on 7 different occasions at Wallowa Lake, and our experiences have been good. Our experiences with WLVR have been the best, so we recommend our friends to start their plans with WLVR before anywhere else. We were met by Jane who checked out the house before we went in. She was very friendly and informative. We met friends from Idaho at the house to spend some time together. The layout of the house seemed strange at first but ended up working perfectly. We ate and hung out together but had privacy when needed. Thoroughly enjoyed our stay. Loved our stay well equipped home. Jan was very helpful and nice to talk with. We REALLY appreciated the opportunity to check in early. We really enjoyed staying at Pine Cone Cottage. It was rustic and simple, as described, but very cozy and well appointed for our family and we sure enjoyed the nice spot tucked in the woods and unwinding in the hot tub under the stars after a long day. Staff members very friendly and helpful. Thank you for all that you do. Retirement party for myself with my brothers and sister in law. So quiet and peaceful. The fire in the cool evenings was awesome. View of the lake was beautiful. Staying on the West Side of Lake was on my bucket list so got to check that off. Friendly, professional, knowledgeable, responsive. The best you all rock! Absolutely beautiful, warm, comfortable home. Everything we needed was there plus more. Thanks for sharing your home with us!